Red wine sangria is one of the most famous Spanish drinks. Spaniards don’t drink it all the time, though: it’s a summer drink only. And we hardly ever order it at the restaurants (except maybe occasionally in tapas bars, but we usually prefer wine or bier to go with our tapas), but we do make it at home from time to time to go with an informal meal with friends. And it’s also very popular in young adult parties (and sneaky 15 and older teens). 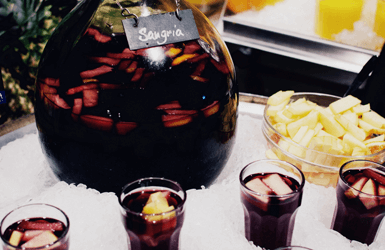 Today we are sharing with you how to make sangria the way Spaniards do. Did you know the word “sangria” comes from “sangre” (blood)? That’s because of the red color of the drink, and that’s why the authentic sangria recipe is made with red wine. While it can be made with cheap table wine from a tetra-pack, I don’t recommend it: you’ll get the type of sangria that is served in tourist-trap bars in Spain. You don’t need to spend a lot of money in an expensive aged wine either (after all, you are going to mix it with sugar and fruit…), just choose a decent young red wine that you like (one bottle serves 4-5 people). For a more chic sangria, you can substitute the red wine by cava or champagne and make a white sangria – the same quality rules apply: €2 bottles are a no-no. 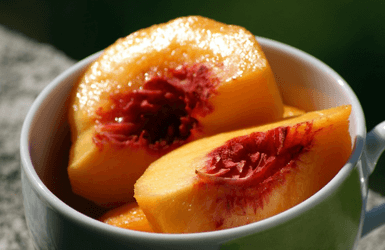 There are many opinions on what fruit to use in your sangria, but if there is one fruit that everyone agrees that should be part of any authentic Spanish sangria recipe this is peach (fresh, not canned!). Some people like it diced, while other prefer it in slices: it doesn’t really matter much: it’s all about choosing between aesthetics or practicality. The next important fruits you need are oranges and lemon (one of each: again, while some prefer to cut it in sections, I prefer it in round slices because it’s more pretty. Just don’t add it to the mix yet: wait until it’s time to serve, otherwise the white part of the grind might release a bitter taste into the wine and you don’t want that. The rest of the fruit is a personal choice: some will add one apple, other some pineapple (again, it should be fresh, not canned), a couple of bananas (not too ripe – I think this is quite a bold choice for a sangria, though), some strawberries for a fancier touch the sweeter the better… Spaniards usually choose summer fruit that isn’t too watery (a juicy pear, for instance, might water your sangria so rule it out). You’ll now add 2 to 4 tablespoons of white sugar to the wine and fruit mix, and stir well. The exact quantity depends on how sweet you want it to be (and how quickly your sangria should get to your head: the more sugar, the “happier” you’ll get, and faster). If you want to prevent the sugar from depositing at the bottom of the jar, you might want to turn your sugar into syrup first (add some water to it, heat in a pot on low heat until the sugar melts – but don’t let it brown or it’ll turn into caramel). Brown sugar takes longer to dissolve and might affect the color of your sangria, that’s why it’s not recommended. I know it’s a healthier option, but… sangria isn’t exactly what I’d call a healthy drink anyway. Next add the juice of one orange (you can also use a glass of bottled juice, too, but it won’t be as good). The best oranges from Spain are those from Valencia: large, juicy and with a bright orange color. Some people prefer to use orange soda instead, but in this case you’ll have to wait and add it right before you serve it, so the bubbles aren’t lost during the maceration time. Once you’ve mixed your ingredients well, your sangria needs some time to macerate. 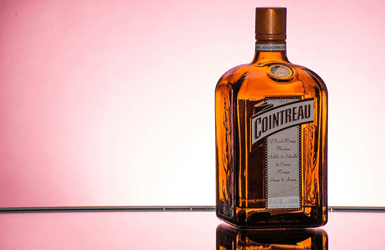 If you drink it right away, it won’t have acquired its characteristic fruity taste yet. Make sure to prepare your mix at least 2 hours before serving. If you prepare it precisely 2 hours before, leave it to macerate in room temperature and add some ice cubs before serving (your sangria might get a bit watered, but that’s OK). But if you have the time, make it around 4 hours before serving, macerate it in room temperature for the first two hours, then put it in the fridge to cool: this way it won’t be necessary to add any ice cubs. If you can, when serving keep the sangria in ice buckets to keep it cool. Otherwise, have ice cubs ready for the guests to add to their sangria as they keep drinking. Enjoy your party and don’t drink if you are going to drive. So what about you? Head to the comments below and tells us: do you have any tips on how to make sangria even better?